2018 marks the 50th anniversary of Vincent sailing from Yokohama to New York on a Taiwanese ship named SS Caroline. So it is befitting that we do a Trans-Pacific cruise to commemorate the milestone. 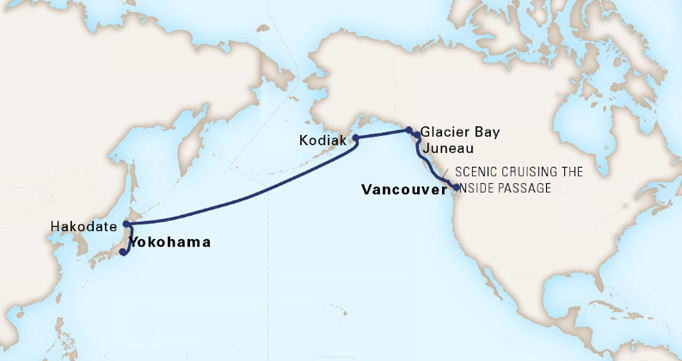 Today's Trans-Pacific cruises usually take place in the spring (April-May) or in the fall (Sept-October). 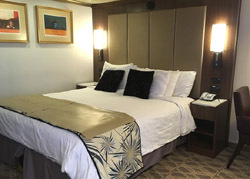 While we were still undecided on which cruise ship and what itinerary, Holland America emailed us a promotion for booking a Suite to receive free gratuities and generous OBC (On Board Credit). We cruised with HAL Rotterdam last year and felt HAL had given customers a good value, so we booked a Signature Suite on the HAL Westerdam, cruising from Vancouver to Yokohama for 14 nights. We tacked on 11 days in Japan on our own after disembarkation. Westerdam is a ship with 1900 PAX capacity and 800 crew, one of HAL's 4 Vista-Class ships named after the 4 points of a compass in Dutch (Oosterdam, Westerdam, Zuiderdam and Noordam). We packed winter gear for Alaska, and light jackets for Japan. Our last trip to Japan was in October 2013 amid the MLB World Series, and Red Sox beat St. Louis Cardinals to win the championship. 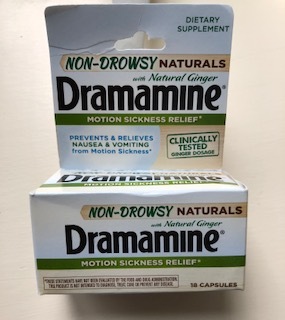 For motion sickness remedy, MC brought along a pack of over-the-counter Non-Drowsy Dramamine with Natural Ginger, as well as a package of MotionEaze (a topical oil to dab behind the earlobe.) 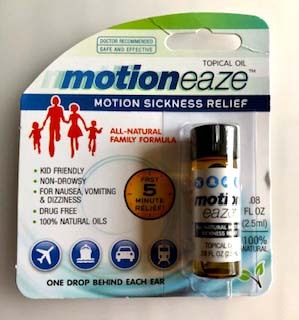 These could be found in most drug stores including Wal-Mart. Below is our cruise map and itinerary. 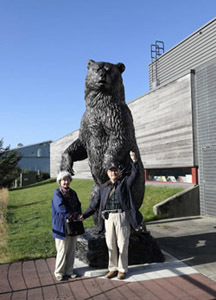 Many sea days between Kodiak and Hakodate, but we had no problem finding things to do. Below is the customized Google map showing our land route and stops in Japan. This was a long traveling day. A taxi picked us up at 5am, flight departed Logan at 7:25am for Seattle, then connected to another flight to Vancouver. We were lucky that there were no weather-related flight delays. Taxi fare from Vancouver airport to downtown was fixed at CAD$35. The city was already quite dark with cloudy skies at 3pm. The city was drizzling all day, a grey day without sunshine. We were told that this was the beginning of their rainy season, which would last till March of the following year. Vancouver's cruise terminal is at Canada Place, only 700 meters from our hotel. However, it was still too far to walk. A long line of guests formed at Hyatt to wait for taxis to the cruise terminal. On a rainy day with 3 cruise ships embarking, taxis were in short supply. We were on board before noon and our room was ready! We loved our spacious Signature Suite. It came with 2 desks, USB chargers at each side of the bed and plenty of closet and drawer spaces. The bathroom came with a double sink, a bath tub and a separate shower. The balcony had two lounge chairs and a round table. The 50-inch flat screen TV in the room had channels for ESPN 1 & 2, and a channel for "Special Events" which on this day (a Sunday) was broadcasting Sunday-night football. We anticipated it would show Monday-night football, Thursday-night football as well as some of the Major League Baseball games, much to Vincent's delight. Westerdam arrived at Juneau shortly before noon. Our ship (and another ship named Norwegian Pearl) were the last ships to visit Juneau for the year. 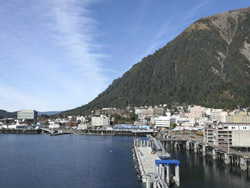 Juneau is Alaskan's state capital. Surrounded by water, forest and mountains, the city of around 32,000 welcomes more than a million visitors each summer. The Macaulay Salmon Hatchery was already closed for the season as was the city trolley tours. We did not want to take a bus to see Mendenhall Glacier (because we'd be seeing glaciers from the convenience of our balcony the very next day), so we walked to downtown, saw shops and the Red Dog Salon, whose fame precedes the actual place. This afternoon the temperature was about 52F, sunny and no wind. It was very pleasant to walk. We did not eat at the popular "Tracy's King Crab Shack" in Juneau, instead, we dined at the elegant specialty restaurant on the ship called Pinnacle Grill for King Crab and King Salmon. Today was the highlight of our cruise. 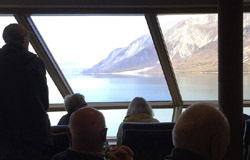 Three Glacier Bay Park Rangers (and two additional staff) joined Westerdam at 7:15am, and they stayed with us till 6pm. One of the Park Rangers spoke on the PA system to tell us about the history of the Glacier Bay, as well as narrating the outside scenery along the way. They also gave a talk of "The Wonders of Glacier Bay" at the main stage theater at 2:30pm. The narrow Johns Hopkins inlet can only be sailed through after September 1st, because it is a nursery ground for baby seals (born each year around June) so cruise ships cannot go into the inlet until the baby seals are big enough to look for food themselves. Only two cruise ships per day were allowed to sail into the Glacier Bay National Park, and the ship must also meet some "Green" criteria. We were the last ship to visit Johns Hopkins Glacier this year. Our captain shut down the engine, so that our ship could linger in front of the face of Johns Hopkins Glacier for a while. Only 250 years ago, the whole area was covered by one giant sheet of glacier. Today it is separated into pockets of smaller glaciers. Glaciers are rivers of ice. We ate in the main dining room for breakfast and lunch and shared tables with travelers from different parts of the world. Quite a few were cruising for 42 days - continuing 14 more days from Yokohama to Shanghai, and then another 14 more days from Shanghai to Hong Kong. Attended a lecturer about Alaska the Territory. TV's "Special Events" channel carried Thursday-night Football live, Patriots vs Colts. Vincent watched the game live on TV and exchanged comments with Philip and Austin using iPhone text via internet. The wonders of technology! Kodiak is an island with their main town also named Kodiak. We were warned that this area rained a lot, but we arrived to sunny 50'F weather. The cruise dock was about a mile from town center, so the port authority used several school buses to shuttle us from ship to town. These were the only buses available on the island. Kodiak was the capital of Russian Alaska until the United States purchased the territory in 1867 for 7.2 million, but the Alutiiq natives have called it home a millennia before the Russians arrived in the 18th century. The harbor front was dotted with many fishing boats. We walked a bit in the town, saw a few museums and stepped into the blue-domed Russian Orthodox church built around 1925. We found the Aquamarine Café, intending to try its "Mouthwatering crab cakes", but the restaurant did not have them available that day. We did not ask whether it was because the crab season was over, or because the port guides were outdated. Dinner was at Lido buffet for its "Alaskan Salmon Bake" of baked wild salmon as well as seafood soup of clams, mussels and shrimps. They were all very good. The sea was calm, which lead to smooth sailing. Lunch at Pinnacle Grill was a very good deal for just an additional $10/pp. Attended a lecture about who owns the Arctic Ocean, and the conflict in southeast Asia on the 200 miles of Economic Zone. Attended a lecture on Japanese History by Terry Greenberg. Around 4pm, our ship started sailing parallel to a gale wind, and the Captain announced that this strong wind condition would continue until the next day. Even with that, we still had a great dinner and an enjoyable conversation with a nice couple from Toronto (Karen and Gerry) at the Lido buffet. We ate together a few more times for the remainder of the cruise. The ship's clock turned back one hour tonight, we were 7 hours behind Boston. We crossed the International Date Line this evening at 10:30pm. All we had to do was turn the clock back one hour, and then the following morning turn the calendar date to October 10th, skipping October 9th all together. So instead of being 8 hours behind Boston, tomorrow we'd be 16 hours ahead of Boston, and 4 hours ahead of Japan. We'd be in the same time zone as Petropavlovsk-Kamchatsky, Russia. We would continue to have a series of 25-hour days by dialing our clock back one hour at a time. By the time we reached Hakodate Japan on 10/13, we'd be only 13 hours ahead of Boston. We were invited to a Mariner Society lunch hosted by Captain Mark Rowden in the main dining room. One becomes a Mariner Society member after one has cruised with HAL, therefore this was an event to welcome repeat customers. We were cruising along the southern side of the Kuril Islands of Russia (千島列島 https://en.wikipedia.org/wiki/Kuril_Islands ), which is a long string of 56 volcanic archipelago stretching from Hokkaido, Japan, to Kamchatka, Russia, separating the Sea of Okhotsk from the north Pacific Ocean. To set the correct time zone on our iPhone, we had to select the time zone of Magadan, Russia, a large city in the same longitude. Spent time at the ship's shop trying to use up all our remaining OBC before our cruise concluded in two days' time. We docked at an industrial port called Ichiei (一映) Marina at 6:30am, 2.8km north of downtown Hakodate. 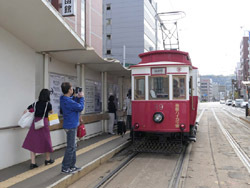 The port authority provided free shuttles from 9am to 5:30pm between our ship and downtown Hakodate train station. Each way was only 20 minutes. •	Hakodate Asaichi (函館朝市, Hakodate Morning Market) - approximately 280 shops offering eat-in and take-home seafood and fruit products. •	Fort Goryokaku (五稜郭)- a star shaped, Western style citadel built to defend from foreign invaders, and ended up used only during a civil war. However, we skipped this site because it required a fair amount of walking. • Mount Hakodate (函館山, Hokodateyama) - offers magnificent night views of the city and its surrounding bays. But the rope-way to the mountain top was closed for maintenance when we were in town, and the bus schedule to the mountain top was sparse until after 16:30. So we had to decide between visiting the mountain top and the Kanemori Red Brick Warehouse. We chose the latter. • Kanemori (金森) Red brick warehouses - warehouses in the bay area converted into a unique shopping mall. May be Kaohsiung's 駁二特區 was developed after this type of renovation? Specialties: Seafood products - Fish, Crabs, Sea Urchin and Squid. The main cluster of restaurants in the Morning Market are at どんぶり横丁市場 (Donburi-Yokochō market). We had lunch at 朝市食堂二番館 (Asaichi Shokudo Nibankan, 位於 駅二市場 的二樓) instead, after reading an internet blogger's journal, for its more spacious seating area. The grilled Mackerel, miso soup, and pickled daikon were all very good. Squid was a specialty in this area, many eateries served it raw on Donburi or as sashimi. We ate grilled squid two different ways, and one was much better than the other. See today's photo for details. In the evening, a group of Shinto priests came on board to perform three Shinto Ritual dances on the stage. Most of these Shinto priests looked like they were in their 20's or 30's. Westerdam pulled into Osanbashi pier at 6:30am. About 1000+ of the 1800+ passengers were disembarking today, and new cruisers would embark the ship to go on to other ports in Japan, Korean and then to Shanghai. Vincent went to the open deck to take photos of the city. He could not stop telling people that he was here 50 years ago boarding a ship to the USA. We spent most of today traveling. First by taxi to Yokohama station to get our JR East Nagano-Niigata Area Pass and train tickets with reserved seats, then we took a 3 hour ride with one transfer to Matsumoto. Our hotel was only 5-min walk from Matsumoto station. Vincent was quite pleased with the fast WIFI at the hotel, compared to what we had on the HAL Westerdam. 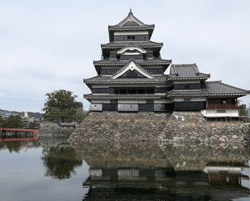 The main attraction in Matsumoto is the the 400-year-old Matsumoto Castle (松本城 維基百科), which is ranked among one of the top 3 castles of Japan (Himeji, Matsumoto, and Kumamoto). Local specialties include: Soba noodle, Shinshu Miso (信州味噌), Apples and Watermelons. Shinshu 信州, is an ancient name for the region at about today's Nagano Prefecture 長野県, therefore, any produce grown or manufactured in Nagano Prefecture can be called Shinshu Specialties 信州特產。Shinshu miso has the largest share of the Japanese miso market, and Matsumoto area is one of the major production centers for it, the cool climate and pure air makes it ideal for aging miso. We visited the Ishii Miso (石井味噌) factory, had a delicious miso-themed lunch, and got a courteous 12-min guided tour in English. The miso barrels are made from Japanese cedar and hold about 4.5 tons of miso, about 10,000 pounds. After 6 months of fermentation, the miso in the barrel gets a top-to-the-bottom stir by shovels. After 1 year, some will be sold as a 1-year miso, some will get moved into a different barrel and warehouse to continue fermenting until the 3-year mark. A small amount will continue to be fermented until age 10, but our guide said he liked the 3-year miso better than the 10-year. On the third day, we took a day trip by train to Karuizawa (輕井澤), a mountain resort. MC had been curious about that name, 輕井澤, after reading that name in the lyric of a song sung by Misora Hibari (美空 ひばり), so now she is happy that she has visited the place. Review of Hotel Dormy Inn Matsumoto - Good location, only 5-min walk from train station, and friendly staff. However, we did not like it as much as we liked the Dormy Inn in Nagasaki where we stayed in 2013. We booked a 236 sq-ft "Standard Twin Room Non-Smoking", but the room's layout did not feel comfy at all. The first floor's lobby and its adjacent breakfast area had a persistent fry-oil smell from the tempura-frying in the kitchen that produced a tasty breakfast every morning. We took a 2 and 1/2 hour highway bus to Takayama in the Japanese Alps. The scenery was spectacular. Takayama Local Specialties: Hida Beef (飛騨牛, from the Japanese black cattle), Hoba Miso (朴葉味噌, a grilled dish with miso on hoba leaves), Hida Ramen Noodle, Sticky rice flour ball dipped in syrup (dango), Hida Soba (handmade buckwheat noodle) and Hida Tou-Fu (豆腐). Hida (飛騨) is the name for this mountain region (also known as the Japanese Alps), therefore towns in here often add Hida in front of their names. For example, Japan has more than one cities named Takayama, so people often say Hida Takayama (飛騨高山) to refer to this particular one in Hida region. Takayama is a very pleasant town to stroll around, we saw many tourists from other Asian countries. Old Town -Takayama's old town has been beautifully preserved with many buildings and whole streets of houses dating from the Edo Period (1600-1868), when the city thrived as a wealthy town of merchants. 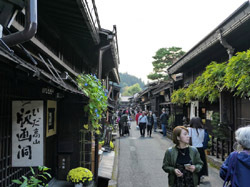 The southern half of the old town, especially the Sannomachi Street (三の町), survives in a particularly pretty state with many old homes, shops, coffee houses and sake breweries. Takayama Jinya (高山陣屋)：Historical government house. The Takayama Jinya served as the local government office headed by the officials dispatched from Edo (present day Tokyo). The building complex was in official use until 1969. It includes various nicely maintained tatami mat rooms that once served as offices, conference rooms, guest rooms and residential space. The residential area looked like a samurai movie set jumped out of space where corrupted local officials lured the protagonist to the premises under a pretense and then later tried to ambush him, so he had to fight with sword and back out to escape. Hida Beef - we researched online and picked two restaurants as candidates, and those two happened to be the same restaurants our hotel's concierge recommended. One is called Ajikura Tengoku 味蔵天國, the other is called Maruaki 丸明. She said if we want BBQ (yakiniku) beef, go to Ajikura, if we want steaks or shabu-shabu then go to Maruaki. We went to Ajikura. The wait time was about 1-hr to be seated. The beef was marbled and very tender. Hida Folk Village (飛騨の里, Hida no Sato) is an open air museum exhibiting over 30 traditional houses relocated from the Hida region. MC took a bus there and arrived at about 4 pm, but the sky looked like it was about to rain, and the village involved a fair amount of walking, so she did not go in, thinking that we would have a brief stop at Shirakawago village the next day on our bus to Kanazawa, thus we'd have a chance for a glimpse of the thatched-roof houses there. Review of Hotel Spa Alpina Hida Takayama - We loved it. It was a delightful stay, nice onsen and comfortable room. We booked a 217 sq-ft Twin Room - High Floor - Non-smoking, and were assigned a spacious room on the 8th floor with views of the mountains. We could not have been happier. The hotel is a 4-min walk from Takayama station, friendly staff, soft-colored decor and wide hallways with thick clean carpet. Good Onsen facility on the 9th floor. Coin-operated Laundromat is just diagonally across the street next to the post office. For today's transfer from Takayama to Kanazawa, we took a Nohi bus through the mountains for 2 hours and 20 minutes. The scenery was not as spectacular as the prior segment between Matsumoto and Takyama, because this time we went through many long tunnels where we could not see any scenery. Kanazawa (金沢), bordered by the Sea of Japan to the west, is a mid-sized city rich in culture and arts & crafts. See its wikipedia page for history, and its Japan-guide page for attractions. We loved our 3 days here. Vincent said he could move here, especially after two days of lunching on Mori Mori Sushi, we were enchanted. During the Edo Period (1600-1868), Kanazawa served as the seat of the Maeda Clan(前田), the second most powerful feudal clan after the Tokugawa in terms of rice production and fief size. 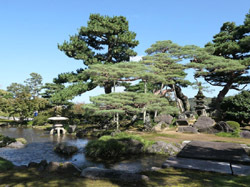 The Maedas channeled their vast wealth into arts and crafts, instead of military pursuits, and Kanazawa became the centre of the "Million-koku Culture", which helped ease suspicions held by the Shogunate over the domain's wealth. 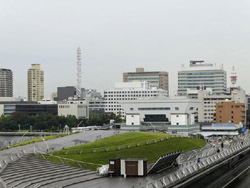 Accordingly, Kanazawa grew to become a city of great cultural achievements, rivaling Kyoto and Edo (Tokyo). The Maeda clan continued to rule Kaga Domain (加賀国, an ancient name) from Kanazawa Castle until 1871 at the end of the Edo period. During World War II, Kanazawa was Japan's second largest city (after Kyoto) to escape destruction by air raids. To get around Kanazawa, we used the loop bus and purchased a day-pass for 500 yen/pp from our hotel concierge. Therefore, even though we chose our hotel in central downtown, we think choosing a hotel near the train station won't be a bad idea at all, because one can get to attractions by the frequent loop bus, and train station has many dining options nearby. 金澤城 Kanazawa Castle - 14 generations of the powerful Maeda Clan ruled from this castle for more than 280 years. Most of the castle was burned down from the 1881 fire. Today's castle is mostly rebuilt. 東茶屋街 Higashi Chaya District: A chaya (lit. teahouse) is an exclusive type of restaurant where guests are entertained by geisha who perform song and dance. During the Edo Period, chaya were found in designated entertainment districts, usually just outside the city limits. Kanazawa has three well preserved chaya districts, Higashi Chayagai (Eastern Chaya District) is the largest and the most interesting. Nagamachi Samurai District 長町武家屋敷跡 : Nagamachi (長町) was a samurai district located at the foot of the former Kanazawa Castle, where samurai and their families used to reside. The area preserves a historic atmosphere with its remaining samurai residences, earthen walls, private entrance gates, narrow lanes and water canals. Eat sushi at Mori Mori - high quality sushi made fresh at reasonable price, what's not to like? Mori Mori has two locations in Kanazawa, one at Omicho market (open till 4pm) and the other on the 6th floor of the Forus building next to the train station (open till 11pm). Mori Mori also has branches in Kyoto, Kobe, Osaka etc. Review of Hotel Trusty Korinbo: It is an elegant 4-star hotel with very good breakfast, convenient location but small rooms. The layout of the room was not ideal, they should get rid of the couch and the oval coffee table, replace them with a bench-type desk top and a chair for the desk.